So yesterday, I volunteered for Stitch. It was a great time working with a fun crew of gals and meeting the main 5 women that put this shindig together. And this fellow volunteer chica was chosen as a last minute model...ah! Had I only stayed a few more minutes!!!! Maybe I would have graced the runway. 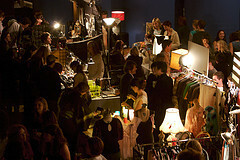 It's basically a show featuring crafts, artisans, designers, a fashion show, and the like. I showed up for the craft bazaar a bit later with Solan in tow and was fairly impressed. I enjoyed it all despite the fact that there was a tendency to see duplicates of several crafts and such. But, such is life. One thing is for certain, I do want to get into the show for next year. I was inspired artistically and got some great ideas of how I want to set up my booth for Blue Genie. I'm pretty excited to be a part of this event and this week will be a week of orientation meetings for me with the Blue Genie folks. 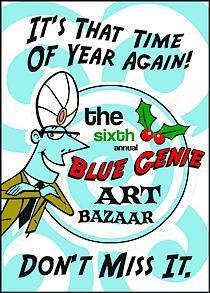 Many of the crafters I saw last night will be there at Blue Genie, so that's cool. Still, I have so much to do. And Thanksgiving is almost here, wow! This coming weekend, I'm a part of the East Austin Studio Tour. And I'm getting fitted for my costume tomorrow afternoon. I'm a little nervous too! Anyways, Veronica has been amazingly easy to work with and I'm so thankful that she chose me to be a part of the fancy fun. It should be a good time, but a hard working one at that. I'll fill you in with more details as the week progresses. 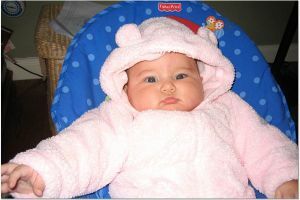 And last but not least, my wee little niece, Viviana! Aww, is that your sister's new bee-bee? Cute! uau! amazing how much you're up to!!! Wait! I missed you in the studio tour. What were you in costume for? I'm so bummed. Post pics!! Did you get my letter??? I check everyday... no new post?? Had to check in and see how you were doing. Sweet little Viviana! Love that name. Hope you are just busy with the holidays and such. How's Blue Genie going???? HOpe you are selling lots. I'm going to try to get by this week.